A couple of summers ago I saw three children standing on a street corner in northern Utah giving away tomatoes. “Free tomatoes,” read their hand-made sign! You may not find free tomatoes, but some grocery stores in my area have been charging just 25 cents a pound for Romas! If you’re ever going to learn to can, and canning tomatoes is super easy, this is the time to do it! 1. A bit of confidence. Canning is way easier than you might think. The following instructions may seem complicated and intimidating, but trust me. Just start gathering your supplies, get your hands on a few pounds of tomatoes (Romas will have more flavor, Beefsteaks less so), and set aside about two hours. 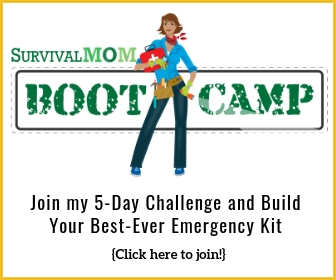 When you’re finished, you’ll be amazed that you ever thought canning was difficult and you will be SO PROUD of yourself!! 2. An inexpensive set of canning tools. Walmart carries the Ball brand for less than $8. It contains jar tongs (there really isn’t a good substitute for these), a magnetic lid lifter (used to lift the flat lids out of the hot, sanitizing water), jar funnel (helpful, even when you’re not canning), a bubble remover/headspace measuring tool. There are other tools out there but if you have these four, you’re good to go. 3. Canning jars. Not any jar will do. Canning jars are designed to withstand high temperatures and pressure. Both Ball and Kerr sell “Mason” jars, which has become, more or less, the generic name of canning jars. Some will actually have the name, “Mason”, on them, others might be marked, Ball or Kerr. If you find canning jars at estate or garage sales, only use them for canning if they are marked with one of these brand names, to be on the safe side. I stick pretty much with just wide-mouth jars. I just like the style and I find it easier to fill them and then maneuver the food around inside the jar to remove bubbles. Walmart carries a generic brand that is a bit cheaper, but canning experts have told me they aren’t in love with them, that their seals sometimes fail. You may save a couple of bucks buying them but then may have to turn around and buy Ball lids, to be on the safe side. New canning jars come with lids and rings. They’re ready to go! What size jar should you use? Since we’re canning tomatoes, think about the recipes you make that call for canned tomatoes. Do you generally use the 14.5 ounce size can or do you make large batches of food that call for 28 ounce cans? I’ve been using the pint size since I’d rather open one jar and use it all than end up with leftovers that have to be refrigerated. Quart size jars are handy, though, and hold 2 pints. 4. Lids. These are only the flat lid that fits over the opening of the jar. They have a rubber ring on the underside of the lid, and this is what provides the airtight seal and protects the contents from contamination. 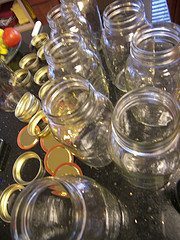 Jars and rings can be re-used, again and again, but the lids cannot. Check out re-usable lids by Tattler. They get rave reviews by everyone I know who has used them. 5. Rings. New jars come with both lids and rings, and there is no need to buy replacements. Unless the rings rust or are bent, they can be re-used. 6. Large pot with a lid. 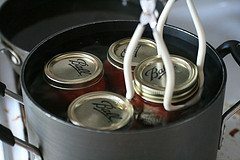 There are inexpensive water-bath canners that come with a rack for lifting several jars at once, placing them into the pot of hot water and removing them. I have mixed feelings about using a rack since the jars can wibble and wobble, and I’m always worried one will topple out. I prefer just using the jar tongs. Your mileage may vary. You do NOT have to have an official, “water-bath canner.” Any large pot with a lid will do, but a canner is definitely HUGE and will hold more jars. 7. Lemon juice or citric acid. Tomatoes, even heirloom varieties, do not contain enough acid to safely can them using the water bath method without adding extra acid. I place a quarter teaspoon at the bottom of each pint jar before filling them with tomatoes and water. 8. A ladle. You’ll use this to add hot water to your jars of tomatoes. 9. A small saucepan for heating water to sanitize the lids and a 4-quart pan/pot for heating the water that you will add to the tomatoes in each jar. 10. A bowl of ice water. You’ll want to peel the tomatoes before canning them. Drop them in water that is at a low, rolling boil. Leave in for a minute or until you see the outer skin begin to crack. Immediately scoop the tomato up, using the ladle, and place in ice water. The skill will be ever so easy to peel off! 11. A cutting board and knife. You may want to cut the tomatoes in smaller pieces, although many people just press them down in the jar, whole. 12. 2 or 3 kitchen towels. You’ll set these on your counter to protect both your hot jars and countertop. 13. Finally, TOMATOES!!! Even if your garden produced few tomatoes this summer, since you’re just learning how to can, then buy 8 pounds or so when you find them on sale. This will likely give you enough tomatoes to fill at least a case (12) of pint jars. 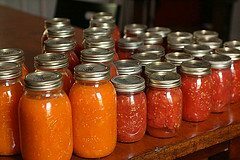 Going forward, it will be important to find inexpensive sources of tomatoes and other produce that you want to preserve. Keep in mind that by canning your own food, you will always know exactly what it contains. There will be no hidden high fructose corn syrup, MSG, ultra high sodium, etc. That’s the beauty of growing and preserving your own food. Okay, I am a novice canner, but the Food Channel Lady made it seem less scary. I love tomatoes and they can be used in almost everything, so they are going to be my first shot. Great post, especially since everyone has tomatoes coming in. 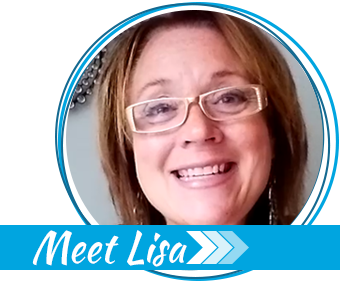 It is wnderful that you are inspiring others to can, as it is a relatively simple process once you have your tools. I would like to comment about a couple of your numbered points. 3. Wide mouths are definitely more universal. Tomatos go in any size jar but if you ever had to place peach halves or pack pickled beets or beans you want wide mouth. The narrow mouth is usually cheaper, so if you plan on giving away any of your beautiful food as gifts to relatives, have a few narrows as you probably won’t se them again. 5. rings do rust and bend over time. I still use the rusty ones. 6. It is true you can use any pot, PROVIDED it is deep enough to cover the jars with an inch or two of water and still have a roiling boil over them. Also you want something in the bottom to keep the jars off the direct contact with the bottom of the pan. This will raise the jars some. This is what the rack is for. It also keeps the jars from heating each other as much in boiling. I never the lift the rack into the pot. I place the rack in the kettle, fill half full of water, and bring the jars to the rack after filling. A rack also has two settings. One completely submerged and another where you hang the handles over the pot edge after lifting them out part way. This brings the tops of the jars out of the water with less chance of being scalded. I do not cut my tomatoes, I blanch them, slip their skins and shove them in. 7. I just add a tablespoon of vinegar for extra acid. Even with that I always boil my tomatos after opening for at least ten minutes before tasting. This has been a good year for tomatoes in our area!! Have been busy canning salsa, tomatoes and basil, and tomatoes with garlic. Love the taste of home-canned tomatoes!! This is really a great post. I have to say that in all the years I’ve been canning I have NEVER had a problem with any of the Walmart mason jars. Every time I have used them I have had perfect seal success. The ones that never sealed were the Ball brand. Of course, that happened very, very rarely. Before you buy the jars at Walmart, open the box the jars are in and inspect the jars for any defects. Also inspect the lids. They place the lids in a way that makes it easy for you to inspect them without ripping the container plastic that encases them. Like I said, I’ve never had a problem with the Walmart brand. They serve their purpose well. And if you like Ball, check out the Christmas Tree Shop. They sell Ball jars for a little bit cheaper. Thanks for a great post! I canned tomatoes yesterday, and I have been putting romas in the freezer until they are all ripe and I can make a big batch of tomato sauce at one time. I’ve gone back to water bath processing because my ceramic top stove won’t get hot enough to bring my big pressure canner up to temp fast enought. I’m thinking of getting a fish fryer or turkey fryer so I can use it, even though it says not to use it outdoors. I don’t know why that would matter if I can control the temp/pressure properly. Does anyone know if it would be a problem? I hate that I can’t use my pressure canner. re canning on a ceramic top stove – I, too, was dismayed to find I couldn’t can on my stove but I bought a large “hot plate” ( a single burner unit) I actually bought two so I can do two lots at a time. 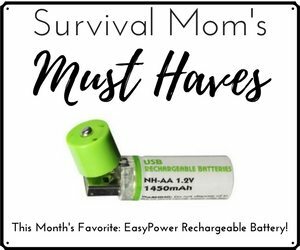 Buy the one with the highest wattage (mine are 1200 watts – it took a while to find them – most are 1000 watts) and buy the largest “ring” you can find. You have to have counter space enough for it too but at least I can water-bath can in my kitchen – haven’t tried pressure canning with this setup yet. I am new to this and just getting ready to try my first batch. I was wondering, can I just make my usual tomato sauce in a pot and then can that? I usually put ground turkey in my sauce. Not unless you have a pressure canner, I don’t think it’s safe to can turkey in the sauce without one. I would put the turkey in when you re-heat the sauce for use. I agree with Halfkin. I grew up canning, have been doing it forever, and the tongs are a necessity. I also really like using a funnel (it really helps keep the rims clean before attaching lids) and have never used any of the other tools mentioned. Halfkin also makes important points about keeping the jars off the bottom of the pan in a water bath canner. The hand-cranked food mill cuts WAY down on the time the whole project takes, and quickly and easily removes skins and seeds from almost everything you want to can, whether it be applesauce or tomatoes, especially if you are processing a lot at once. I just throw the tomatoes (whole) into a huge pot, cook them down until soft, then run it all thru the mill. What’s left over is all the skins and seeds and I throw that to the chickens. Since I almost always preserve tomatoes for sauce anyway, it’s easier than messing around with umpteen extra steps trying to remove skins one at a time. Also, I usually use a pressure canner to eliminate the need to add any citric acid. Mindee: I often make sauce before canning it – saves all kinds of time later, and I love having “dump and serve” food on hand anyway. The only caveat is that spaghetti sauce usually has lots of herbs in it, and canning can alter the nice taste of the herbs. What I do instead is make the sauce without the herbs (meat, tomatoes, garlic, onion, salt) first, can it as such, then add my dried herbs when it’s time to heat it up and eat. Thanks Sarah! I purchased a hand mill for grinding applesauce this year but it never occured to me to use it with the tomatos! Duh! But you bet I will now! My Mom and I canned 23 qts of tomatoes and 27 pints of green beans this week. I canned tomatoes for the first time ever this month, and it was much easier than I had thought! My wonderful neighbor called and asked if I wanted free tomatoes- did I ever! Thanks for the great encouragement for others to try their hand at this important skill. Do you use fresh lemon juice or the store bought? The sound of them popping is pure joy. They are so pretty too. I just bought 6 lbs. of strawberries for less than $10. I can’t wait to try canning strawberry jam. I agree with other experienced posters that canning togs are essential, and a canning funnel nearly so (unless you want to spend an inordinate amount of time wiping rims) but the rest is optional. I have canned for many decades using my fingers to retrieve the lids from hot water, and removed bubbles with a plastic knife or something (metal can scratch, so just be careful if you use a table knife) and never had to “measure” headspace. Just fill your jar to the shoulders and don’t fill the neck-easy peasy. Ummm, canning TONGS. Canning togs (usually an apron) are nice too. I’m a little behind but I canned my first tomatoes today. I made salsa. Thanks for haivng a skill of the month. It really helps me to keep learning new skills. I have never canned anything. I have two mason jars that I drink lemonade from and no lids. Recently, while trying to find another station to watch I saw on Home and Family a segment on canning. I have been watching youtube videos to ease myself into the idea of canning so I decided to watch it. This woman went through all the steps but when it came time to put the water in the jars she did not. The jars had moisture fogging up the glass from the inside and it just did not look right. I have not seen that from any other source. Is that okay? any easy way to skin tomatoes is to wash and core them, then pop into a zip lock bag and put in the freezer. wait for a cold day when you will appreciate the warmth that canning brings and defrost the tomatoes. the skins slip right off after being in the freezer for a while. i heartily urge you to get a copy of the newest ball canning book. your library probably has one. if not, they are only about $12 to buy. 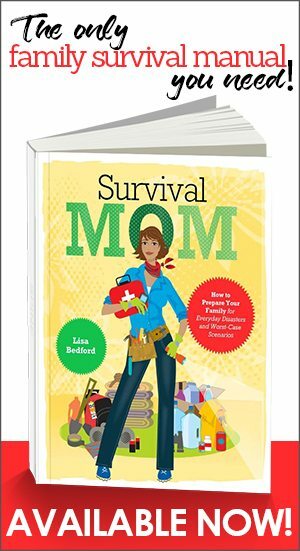 anything you need to know about safe and tasty canning, freezing and drying is in that book, along with recipes for using your home preserves foods. they explain, for example, why you need that lemon juice to prevent botulism. and how to substitute vinegar or citric acid and in what proportions. they point out that using fresh lemon or homemade vinegar will only bring the tomatoes to a low enough pH if the strength of the lemon or vinegar is known and the amount needed is calculated. that’s why most folks use commercial acids to keep the pH down.one reader mentioned boiling the jar contents. if the pH is right, botulism can’t develop. if is isn’t right, boiling won’t help because the toxin is not alive–rather is is an excretion of the botulinus bacterium.